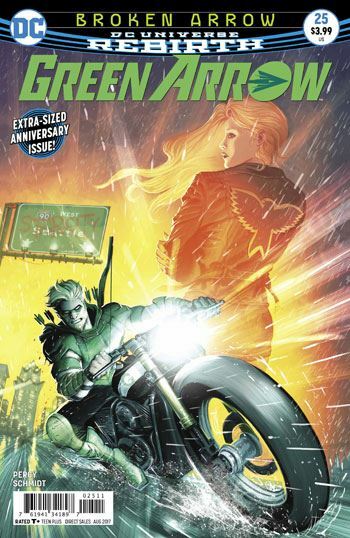 Green Arrow 25 serves as a conclusion to the previous story arc, and the beginning of a new one. It’s an extra long anniversary issue, and makes the most of the expanded size, with a wide range of supporting characters getting their moments to shine. At the end of the previous issue Oliver Queen turned himself in to the police to face the charges of murder against him. We know that he has been framed, as do all of his allies. None of them support this decision. Benjamin Percy has clearly been tasked with bringing a degree of harmony between the Green Arrow comic and the Arrow series on tv. I really like the way this is playing out. Diggle is being used well, better than on the tv show, frankly, and another character, up to now only on the tv show, makes a surprise appearance. I have really enjoyed the last few months of this book, with the destruction of Seattle, and now the birth of Star City in its place. There are shades of No Man’s Land, and thankfully those words were actually used in this issue. May as well tip the hat to your predecessors. But the element of the Star City plot that really pleases me is the way it plays off of current politics in the US. Star City is being rebuilt as a playground for the super rich, the weird American concept of Libertarianism, which basically consists of white supremacy and massive exploitation of the poor, while the wealthy sit above the law. Mayor Domini is given some key words, such as tremendous, that cannot help but make the reader associate him with Trump. As the rest of the planet watches with mixed horror and amusement at the parody of itself that the US has become, I have grown increasingly dismayed with the absence of any acknowledgement of the bizarre situation in these comics. Suicide Squad, which once had a strong political bent, seems to be actively avoiding any touchy issues in the current run. I am very pleased to see that Green Arrow is going to tackling this stuff now. It makes sense. Ever seen Denny O’Neil got his hands on Oliver the guy has had a strong left wing bent. Better still, he has been shown to be a bit of a hypocrite at times, a man who wants to solve the worlds problems, but cannot maintain any stability in his personal life. A complex, nuanced Green Arrow in a city that serves as a microcosm of Trumpland could prove to be a brilliant and effective springboard. I certainly hope the book lives up to this promise.